The Scattered People project started as a photo documentary that was developed over six months and tells the story of three families and their plight as refugee claimants. Click here to open the page about these stories. From this project developed the Scattered People Choir. And from that followed the production of this CD. One of the songs "Labarik Sira Hotu" has become well known in East Timor as the song used by the United Nations in their advertisements to encourage people to vote in the August 2001 elections. Afonso Corte Real, a Timorese Australian, was nominated for a Sunnie Award for this song. It was [at the Brisbane Refugee Claimants Support Centre's] environment of support and belonging that the Refugee Claimants Choir was created. It started with refugee claimants sharing their culture by teaching one another the songs of their homeland, and then, under the musical direction of Centre volunteers, developed into a Choir that, since 1998, has performed successfully at a number of public venues in Brisbane and Canberra. Following these performances an opportunity was recognised to use the success of the choir to record a CD to educate and raise the public's awareness of the plight of refugee claimants. RCSC and Lifeline Brisbane worked with refugee claimants to identify generic themes common in their journey. It began with their homeland in peaceful times, the trauma and chaos of war or persecution, their escape to Australia, the difficulties of adjusting to a new environment, the frustration of seeking asylum, and their overwhelming desire for peace and acceptance. The Brisbane Ethnic Music & Arts Centre Inc (BEMAC) contributed to the project as did a number of Brisbane musicians, many of them from diverse cultures and some of them former refugees. 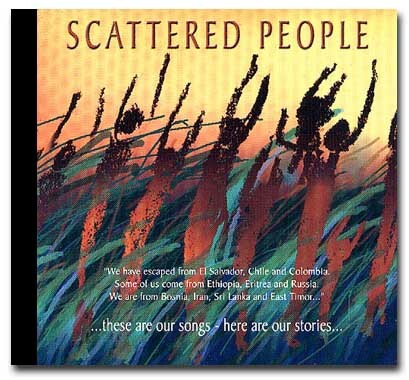 All contributed to the crafting of the CD entitled Scattered People as it expressed the experiences, frustration and hopes of the refugee claimants in original songs and music. Funding for the CD came from the Sidney Myer Foundation and Brisbane City Council. The Council also saw the potential of the music and stories of the refugee claimants to become part of BCC's Brisbane Stories community web site, which showcases the cultural life of Brisbane and its people. Also called Scattered People the web site project commenced in mid 2000, and was developed through a partnership between Lifeline Brisbane, the Refugee Claimants Support Centre, and Brisbane City Council. The project commenced at a time when membership of the original Refugee Claimants Choir was depleted as a result of a number of member's claims for refugee status being rejected. These rejections lead to an increase in depression and anxiety amongst refugee claimants at the centre, thus making it difficult to involve them in the development of the web site. Simon Monsour and Brian Procopis have received the award for Best Producer at the 2001 Sunnie Awards of the Queensland Recording Association for their work on the album "Scattered People". It is a fitting reward for the efforts of two hard working, humble and generous people. It is also a great tribute to their talent. Their efforts came out of Simon's home studio and yet beat a field including some of the best in the business. The Scattered People CD was also nominated for the Sunnie Award for Best Album - Folk/Ethnic/Other. The album evolved out of asylum seekers in Brisbane coming together to sing - finding and sharing their 'common ground' - their brokenness, their resilience, their frustrations and their hopes for the future. Songs were written and performed. Friends of the Refugee Claimants Support Centre contributed their songs as well and the CD was launched in late 2000. Tragically, some members of the choir have been refused protection in Australia and have been forced to return to the countries from which they had escaped. We all fear for their safety. The Refugee Claimants Support Centre Choir has since disintegrated, its members demoralized, disempowered or deported. But their voices and their spirit carry on in this CD. Many asylum seekers in Australia are denied work permission, language classes, access to health services and basic financial support while they undergo a prolonged wait (often years) for their fate to be determined. As legislation becomes increasingly harsh, the Refugee Claimants Support Centre struggles with extremely limited resources to provide assistance.